Last year's parsley plants are now flowering and taking up a ridiculous amount of space in the greenhouse. I'm leaving them in place for now, as they're attracting a lot of insects. 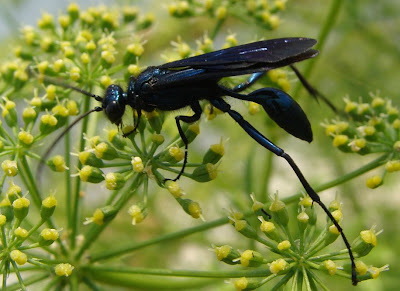 I hadn't seen this particular wasp before, but it's very beautiful, with a metallic blue sheen to its blackness. I like its name too. Sounds like an X-rated show of some sort. So your wasp would make one of those elegant mud nests, with a caterpillar or spider tucked inside for Lunch? Yes, that's right. They're particularly fond of black widow spiders, apparently. Which suits me fine!